This year’s A-block competitors are introduced. Good match and a nice opener. The young lions were fired up, Umino particularly so. Narita took a bit of a beating, getting his nose bloodied at one point. Sabin and KUSHIDA looked very good against each other, so I’m looking forward to their B-Block match very much. Umino’s enthusiasm got the better of him in this match though. He was the young lion who tagged in late in the match, and that almost certainly spells doom for whichever rookie does that in these types of matches. The story here was the animosity between Sho and Dragon Lee. They started the match wanting to fight, and that began the match with some fast-paced action. They continued to be very aggressive towards each other throughout the match. Late in the match Oka tagged in and was up against YOSHI-HASHI, and I really liked how their closing segment. The crowd started to get behind Oka, and even though we all knew he was doomed, I liked how he fought against HASHI at the end. Pretty good match. Taguchi looked good in this match. He did some of his comedy shtick, but for the most part he took the match seriously and hit moves other than a hip attack. Being a Suzuki Gun match, the fight did start before the bell and had a fair amount of ringside brawling. In the ring, the action was fine, but there wasn’t much of a focus as far as building up to a match. Taguchi and Desperado will face each other in B-Block, and they had some good exchanges, but that was about the extent of it. Good match. LIJ looked good as usual. Bullet Club didn’t seem quite as unified, an that cost them. The antics of Takahashi and Scurll were fun though, and theirs is another tournament match that has potential to be very entertaining. Good match. Tiger Mask was very aggressive in this one, taking the fight to Kanemaru for a lot of the early parts of the match. Kanemaru would use dirty tactics (including using a few young lions as weapons) to turn the match in his favor, but the veteran Tiger Mask managed to find moments to hit some big moves. I liked how the momentum shifted steadily and fairly dramatically throughout the match which led to a finish that was mildly surprising and very satisfying. Great match. Flip’s style seemed to throw ACH off a little in the beginning, but once the match really got going, these two men were very evenly matches. Flip’s flips and flights ranged from silly to spectacular, and ACH fought a hard match with some powerful moves and hard strikes. I liked how their styles meshed. ACH also took a fair amount of damage that played in to how the match went along, so it will be interesting to see if any of that damage will carry over into his next few matches in the tournament. Good match. YOH seemed to be the more amped up of the two, and it paid off for him. Both men looked good, but YOH looked very good. I really liked the final part of the match when it felt like both men were searching for the one move that would put their opponent away. Great match. This felt like a big match, and I think it was a great first main event for the Best of the Super Jr. tournament. 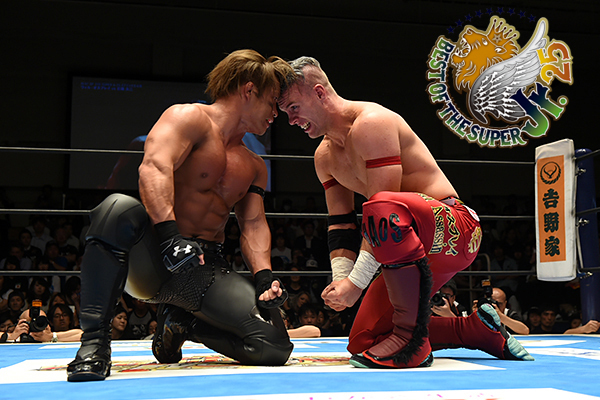 It started quickly with Ospreay on the offensive, but Ishimori used his speed and power to fight back. The match went back and forth with some spectacular moves throughout, and the finish felt important. Overall, this was a very good first night of the tournament. I liked all the tournament matches, and I am looking forward to a lot of the matchups we’re going to see over the next couple of weeks. There were a few surprises on the show, and with the round-robin format it will be interesting to see how things develop. I think the main event was great too, but I enjoyed Gordon and ACH more. I like watching Gordon in action, but I usually pull for him to lose. I really like ACH, and I usually pull for him to win. So yeah, this was perfect for me. Hopefully ACH can put together a good run this year!